While the largest member of the scorpion family -- the emperor scorpion -- is frequently kept as a pet and known for its docile nature, some of the other 2,000 species of scorpion are known for painful stings, lethal toxins and nasty attitudes. If you can resist the urge to squash a wandering scorpion under your shoe, careful observation will help you induce whether it is male or female. Female scorpions tend to have wider bodies than males -- as they will carry up to 35 young inside their bodies for up to a year before giving birth. 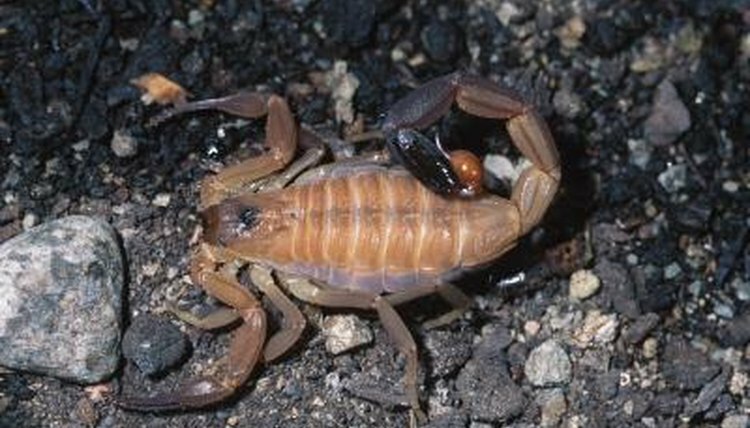 A mother carries the whitish juveniles on her back until their first molt, and sometimes even tolerates other young scorpions riding on her back. If you happen to see scorpions engaged in mating behavior, it will be easy to discern male from female. The male grasps the female's pedipalps -- or pincers -- with his own in an elaborate mating dance. The dance culminates with him releasing his sperm on a suitable surface and dragging the female over it so she can draw it inside herself to fertilize her eggs.